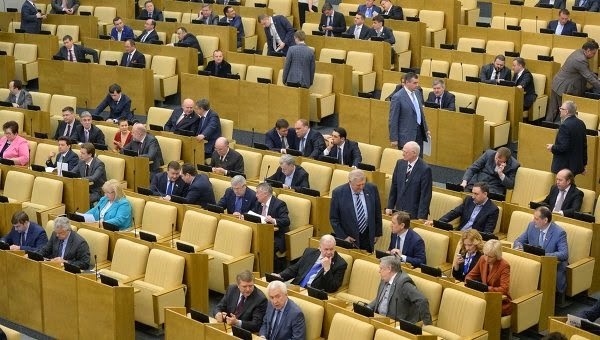 The State Duma on Friday will consider (in second reading) a package of "anti-terrorism" laws, which, in particular, limit the transfer of anonymous payments and equate popular bloggers to the mass media, told the first deputy speaker of the lower house of the "United Russia" Alexander Zhukov. The package also expands the powers of the Federal Security Service and toughens punishment for organizing terrorist attacks and riots. Three papers (on the FSB, the duty to keep the data on the Internet for six months, an anonymous payments) were produced by deputies from all four factions, led by the head of the security committee Irina Yarovaya (United Russia) and later were updated by two amendments - on bloggers and riots. "I would have said that anti-terrorism package consists of several bills that will be considered on second reading. First of all, the introduction of order into remittances, cessation of anonymous money transfers, restrictions on the amount, when such transfers are made without opening a bank account," Zhukov said . He added that the law also introduces the concept of "blogger" - "if the personal page receives more than 3 thousands of hits (per day)." "In fact some registration is required, equating [the blogger] to the mass media" - explained the MP. Why does Putin even need this legalistic fig leaf to hide behind? Oh, it is the old hailed tradition, from Stalin's times. At least they haven't been rounded up to be shot or sent to the gulag. Yet. It may come at a later stage.